Royce Hall is located in North Campus. Every year the Angel City Jazz Festival introduces a loosely knit theme around which our two-week festival of cutting-edge music is assembled. Last year’s theme was Global Jam, featuring improvising artists from around the world, and the previous year’s theme was Rethinking Jazz, with musical celebrations centered around painting, film, dance, and even food. The theme for the fifth annual Angel City Jazz Festival is Artists & Legends, an opportunity for creative artists to celebrate their legendary mentors in concert. Angel City’s founder Rocco Somazzi and co-artistic director Jeff Gauthier hit upon this theme during a particularly moving event at last year’s festival. During this event, Drummer/percussionist Alex Cline offered a tribute to composer/woodwind player Roscoe Mitchell as prelude to a performance by Mitchell’s trio. This tribute was a personal re-imagining of Mitchell’s landmark composition “People in Sorrow” with an all-star large ensemble. The feelings that arose from one artist honoring another on the same stage were very special, and allowed the listener to view both artists in a very different light. This is the kind of tribute that could only happen in an aural tradition like jazz, where so much value is placed on mentorship, musical lineage and respect. The lineup for Artists & Legends provides many opportunities to explore musical lineage. Just as saxophonist Archie Shepp cut his teeth with Cecil Taylor and John Coltrane in the ’60s, a line can be drawn from Shepp to Monk Institute award-winning trumpeter Ambrose Akinmusire, who often tours Europe with Shepp. And as cornetist Bobby Bradford performed and recorded with Ornette Coleman in the ’60s and ’70s, a line can be traced from Bradford to bassist Mark Dresser, who began playing in bands with Bradford in the early ’70s. Other artist and legend pairings include pianists Myra Melford and Marilyn Crispell – two of the most inspiring women in jazz – and guitarist/composer Bill Frisell and filmmaker Bill Morrison, whose film The Great Flood honors the legendary blues musicians of the Mississippi Delta. Vijay Iyer, the #1 pianist in the 2012 Down Beat Critics Poll, was influenced by innovative saxophonist Steve Coleman, whose avant-funk-influenced M-Base techniques revolutionized jazz. Peter Erskine, who has played drums with everyone from Stan Kenton to Weather Report, performs with his nephew, bassist Damian Erskine, and rising-star pianist Vardan Ovsepian. Pairing the local legend Phil Ranelin with the winners of Angel City’s Young Artists Competition is a tribute to Ranelin’s ability to connect with younger audiences and musicians, and the trio of Anthony Wilson, Larry Goldings and the legendary Jim Keltner spans two generations and many musical genres. The symposium “Honoring and Breaking With Lineage” specifically addresses the festival’s focus. In a further expression of the Artists and Legends theme, Angel City’s Rocco Somazzi has joined forces with the Jazz Bakery’s Ruth Price to co-produce the 2012 Angel City Jazz Festival and Young Artists Competition. These two organizations working together – the upstart cutting-edge music festival and the legendary jazz club that is on its way to building a new Frank Gehry-designed performance center in Culver City – bodes well for the future of jazz in Los Angeles. A new collaboration for 2012 is the festival’s association with CAP UCLA (formerly UCLA Live) for two concerts at Royce Hall, complimenting our continuing co-productions with the John Anson Ford Amphitheatre, REDCAT and LACMA. Angel City would like to thank Kristy Edmunds and Phil Rosenthal of CAP UCLA, Lauren Pratt and Mark Murphy of REDCAT, Mitchell Glickman of LACMA, Laura Zucker of the LA County Arts Commission, and the entire staff of the Ford Amphitheatre for their generous assistance in producing events at the 2012 Angel City Jazz Festival. Angel City would also like to thank our esteemed board of directors and interim executive director Rob Woodworth, who graciously stepped up to manage the day-to-day production of the festival. We would also like to express our deep appreciation to our talented graphic designer Kio Griffith, and our crack publicist Susan von Seggern, both of whom contributed mightily to the success of this year’s festival. Walter Thurman and Lithocraft printed this beautiful program, and Greg Burk assisted with the bios and copyediting. Angel City Arts, the non-profit organization associated with the Angel City Jazz Festival, has received generous support from several distinguished philanthropic organizations. The Herb Alpert Foundation and mediaThe Foundation continued their annual support, and this year we received new grants from Chamber Music America, the Doris Duke Foundation, The Shifting Foundation and the Los Angeles County Arts Commission. We are grateful to our talented grant writer Heidi Lesemann for opening many of these doors for us. We would also like to thank our many individual donors without whom the festival would not exist. Leading up to this important presidential election, Angel City seeks to elevate and transcend the public discourse in some small way by placing a spotlight on respect, collaboration, and the musical lineage that is unique to jazz. 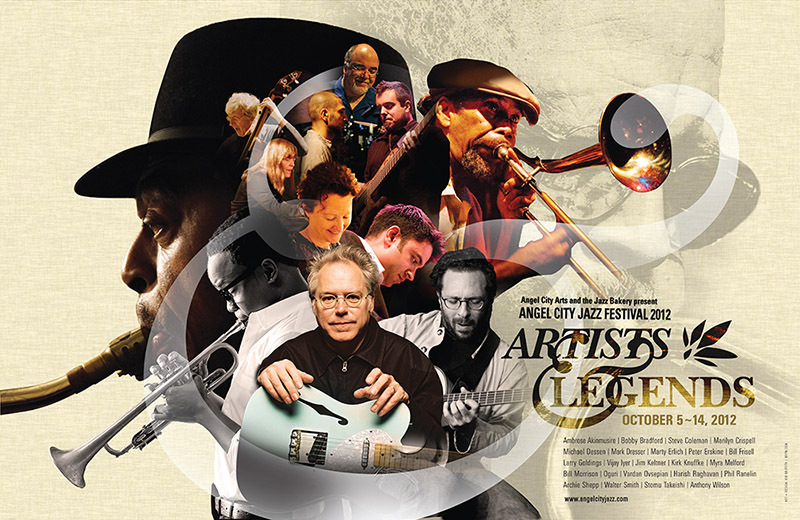 We hope that you enjoy the 2012 Angel City Jazz Festival, and that this discussion about Artists & Legends will serve to illuminate your listening experience.